The winger’s new deal will run up to the end of the 2019/20 season. 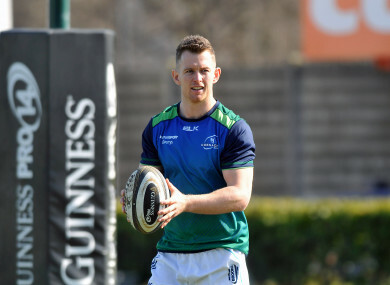 CONNACHT’S RECORD TRY-scorer Matt Healy has signed a contract extension that will run up to the 2019/20 season, the club have announced. Healy recently became Connacht’s top try-scorer after running in two tries in a man-of-the-match performance against the Toyota Cheetahs in the Guinness Pro14. Connacht suffered a one-point defeat in that away tie, but Healy’s brace of scores brought his overall tally to 44 tries in 104 appearances. The winger also made his Ireland international debut on the tour to South Africa in 2016. “I am really pleased to be extending my contract with Connacht. We have some big games coming up in the PRO14 and the home Quarter Final in the European Challenge Cup so there is a lot still to play for before the end of the season. Email “Connacht record try-scorer Matt Healy signs contract extension”. Feedback on “Connacht record try-scorer Matt Healy signs contract extension”.